In most police or court procedures it is vital to know, if the suspect or the victim was under the influence of alcohol. The personnel of the central laboratory is capable of examine the alcohol content of over 20.000 blood and urine samples yearly, thanks to the modernisation in 2012. The clues are admitted by the laboratory in standardized bloodcupping units. The samples in the units are marked by unique barcodes to ensure the anonymity in the process of the measuring and the administration. The samples are prepared by two separate technicians, with the help of semi-automatic sample-dispenser. The etil-alcohol concentration of the prepared samples are measured by two HS-GC device (head space gas chromatograph). The final result is generated as the average of 4 measurments (two measurments on 2-2 colonnas of the devices). According to the analytical measurments, the etil-alcohol concentration of the blood- or urine sample is determined by a forensic chemist in the expert report. The affected persons blood alcohol concentration in the time of the act in question (f.e. felony or offence) is determined by one of the HIFS’s forensic medical expert in an independant - or in some cases, in a joint - expert report. Since November 2014 it is possible to examine the samples drug- or new psychoactive substance contents with the HPLC-MS/MS device. The appointing official is informed immediately in the case of drug or NPS influence, but the laboratory is not authorised to make an expert report on this information: it belongs in the jurisdiction and competency of the HIFS’s Department of Forensic Toxicology, and a few university’s toxicology institutes. The laboratory’s experts take part in international proficiency tests with significant success since 1991. The renewal procedure of the laboratory’s accreditation is currently in progress. The main task of the laboratory is to examine residues of flammable liquids and other distillates in fire debris and in other trace evidences. In addition, the experts analyzes unknown substances (f.e. organic or inorganic liquid residues) for identification and comparison. The goal of the examinations is to verify, if the fire debris contains any residues of accelerants. The examinations require special sample preparation methods; for identification procedures the staff of the laboratory uses 4 gas chromatographs (GC) coupled with flame-ionisation detectors and 2 gas chromatograph/mass spectrometers (GC/MS), one of them coupled with automated thermal desorbtion equipment. In the suspicion of arson it is possible, to examine the suspect’s clothing for the traces of accelerants. The experts can answer the questions regarding the cause of fire, cause of an accident and to determine, if the examined fuels have common origin or not. With the help of the available equipment it is also possible to analyze unknown organic or inorganic liquids, like active substances of different gas sprays and paint dissolvents (f.e. chromofag). The laboratory’s experts are active members of the ENFSI Fire and Explosion Investigation Working Group and they take part in international proficiency tests since 2009. The renewal procedure of the laboratory’s accreditation is currently in progress. The Department of Dactyloscopy includes two sections: Laboratory of Latent Print Examination; Laboratory of Person Identification and Database Management. There are tenprints and palms in the criminal and elimination databases as well as there are only tenprints in the asylum seekers, refugees and international databases. Actually we store approximately 2 million cards. More than 200 thousand palm prints and approximately 60 thousand latents. Approximately there are incoming one hundred thousand cards per year regarding criminal processing. We store the fingerprint and palmprint cards here. The cards have made by ink or LiveScan. We send only the biometric data without personal data into the AFIS. The minutiae are automatic placed and the tenprints searching against tenprints also automatic. If it is a HIT the tenprint examiner has to check it manually. Every result needs to verify by examiner in Hungary. AFIS stores the fingerprints and these are searched in the unsolved latent database. The result of the search goes to the owner expert of the latents. Hungarian experts use the numerical standard to identification. Hungarian numerical standard requires 10 minutiae. We also consider the qualitative criteria (for example clarity, extent of distortion) and other facts (such as surface, method of development). The experts work according to the ACE-V (Analysis, Comparison, Evaluation, and Verification) standard method. Fingerprint examination consists two phases. In the first phase of examination, we analyze the visible prints. The purpose of the analyze is to determine whether the print is used for the comparison or not. The second phase is fingerprint identification examination. Because of we want to determine their mutually identical details under this examination we compare latent print with known tenprints and/or palm prints. First the expert exams the latent print manually with magnifying glass or AFIS (in case of digital photos) and decides whether the latent print is suitable or not. It means that the latent print could have had minimum 10 minutiae and the qualitative criteria are sufficient as well. The expert compares the suitable latent print with the innocent(s)’ and/or suspect(s)’ cards. If it is NO HIT – we scan or import the latent into the AFIS. We use Cogent AFIS in Hungary. The processing may be automatically or may be manually. After the digitalization expert edits the latent print. It means that the expert put each minutia on the image of latent print. We can sign the pattern, core and delta. After the phase of edit the expert sends the print for searching in the database of ten/palmprints. The AFIS provides a candidate list (with 5-25 potential cards). The expert checks the minutiae in every single candidate. If one of the candidates is HIT, the expert checks it manually. Expert asks the Fingerprint Card from the Laboratory of Person Identification and Database Management. After the result had been checked with magnifying glass, two other experts also check it. If it is NO HIT, the latent print is saved into the AFIS database, and searched constantly among the new cards. If this procedure is complete, the report is going to be made. We have used the PRÜM data exchange since 2012. Nowadays we have possibilities to search in databases of 18 Prüm’s member states (Austria, Belgium, Bulgaria, Cyprus, Czech Republic, Estonia, Finland, Germany, Latvia, Lithuania, Luxembourg, Malta, Nederland, Poland, Romania, Slovakia, Slovenia, Spain). 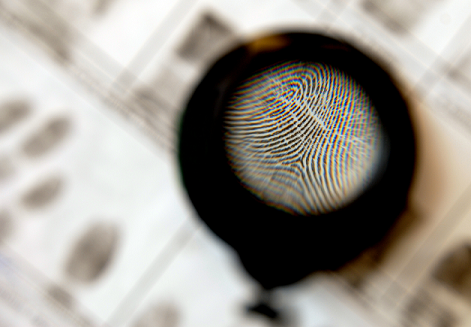 As a result potentially number of searchable fingerprints has been increased multiple times. In case of Prüm procedures the dactyloscopy data exchange is completely anonymized. We use EURODAC System concerning asylum seekers and refugees applications since 2004. Herewith Hungary takes part in the international responsibility. Since July 21st of 2015 there is possibility to initiate law enforcement searches because of the fight of the terrorism and serious crimes. We have contact to the Interpol Bureau thereby we can receive initiates from any countries of the world. The Department of Dactyloscopy has accreditation since 2012 according to the ISO 17025. We involve in several international proficiency tests (for example CTS, Ron Smith & Associates). The main task of the Drug Investigation Department is to do the identification, confirmation of the illicit narcotic drugs and new psychoactive substances in seizures in order to give information to the prosecution or intelligence purposes. In accordance with the national law, the penalty depends on the quantity of pure drugs and new psychoactive substances, therefore the laboratory has to do quantification for controlled substances including traditional and new drugs. In specific cases the laboratory also has to compare samples collected on various sites to prove their common source. For this purpose different impurities are investigated in seized drugs, deriving either from the raw material or from the chemical process. The analytical results of materials seized in Hungary are collected in the central database and trends are evaluated annually. This is the basis of national drug reports (see "Chapter 10 - Drug markets" in National Reports for EMCDDA). The laboratory is accredited since 2013 according to ISO/IEC 17025:2005 for identification of illicit drugs and quantification of main drugs. The renewal of the accreditation is in progress. The Department of Forensic Engineering works within the Directorate of Judicial Expertise of Hungarian Institute for Forensic Sciences. The main duty of the department is to fulfill an official assignment in a case where a law allows or obliges the conduct of the probationary procedure ex officio, or (Eg civil, criminal and administrative matters) or, depending on its free capacity, based on a mandate, to carry out judicial expert activities, to produce judiciary expert opinions on the laws, regulations, instructions, and professional methodology. The experts can do the required measurements and test on-site. The department has the necessary personal conditions and technical background to perform the tasks. The experts of the department carry out their expert tasks in territorial institutes operating at several points of the country. The experts engage in complementary activities in areas of their competence to provide the professional background needed to produce appropriate, well- founded expertise. Two of the experts specialized in road traffic have a certificate issued by IQ-CERT Quality Assurance and Certification Institute certified according to DIN EN ISO / IEC 17024: 2012. For the experts in road vehicle area different computer software are available (PC-CRASH, Virtual Crash, EUROTAX, Audatex system, etc. ), which are regularly updated. For the experts in architecture area different computer software are available, which are regularly updated. investigating tablets, GPS devices, and mobile phones. For the experts in IT area different computer software are available (Oxygen Forensic Detective; Belkasoft Evidence Center Ultimate,… etc. ), which are regularly updated. For the experts in the area different computer software and a so-called deaf-room is available. Main duty of the Department of Forensic Tax and Auditing is to fulfill official assignments in cases where the relevant law allows or obliges the conduct of forensic procedure (Eg. in civil, criminal and/or administrative legal procedures).Further, based on a mandate, the Institue may be assigned to carry out judicial expert activities depending on its remaining capacity. The main professional principle of the Institute is to carry out the task of the forensic expert objectively, based on profound professional knowledge and appropriate to the requirement of impartiality. More than 50 years of professional practice and experiencs is the guarantee that experts of the Institute as well as technicians and office clerks render their services to various assigners on a high professional level. The cases brought before the Institute are mostly complex, requiring itemized data processing, and a wide range of professional experience. In most instances experts give reports in cases, where the verification and/or supervision of former expert’ opinion is required. Experts of the Institue have professional qualifications as master of profession (MSc) and as chartered accountant or master of taxes. Technicians of the Institute have professional qualification as bachelor of profession (BSc) Further, our experts take part in the curricula of LL.M in the field of tax and auditing of Pázmány Péter University, Faculty of Law. Important to us to maintain good cooperation with the professional chambers in the area of the applied common professional principles, methodology and work connections. The Department of Medical Experts was transformed into Department of Biology in 1991, which has been separated into Department of Medical Experts and of Hemogenetics, later renamed as Department of Genetics. This department carries out the comparative study of core and mithocondrial human DNA from biological remains on different exhibits for person identification following international guidelines. Based on the expert activity the Department has the duty to maintain and manage the the national forensic DNA database. The CODIS based database has complete comparability to international databases, which enables the Department to take part in international data exchange in the frame of Prüm Treaty. Beyond the expert work the employees of the Department take part in different scientific projects, aiming the development of technology of forensic genetics. Hamilton AutoLys STAR 4+4 robotic workstation: This freely programmable high-throughput pre-PCR instrument allows the simultaneous processing of up to 72 swabs or other simple samples from autolysis through quantification to STR-PCR set-up within 12 hours. It can be adjusted to the proper management of different preparative kits (e.g., PrepFiler Automated Forensic DNA Extraction Kit - Applied Biosystems, DNA IQ System Kit - Promega, etc.) as well as the most widely used STR-PCR kits (e.g., AmpFlSTR NGM SElect Amplification Kit - Applied Biosystems, PowerPlex ESI 17 Pro Systems - Promega, etc.). Sample tracebility is proven by the use of 1D and 2D barcodes. Hamilton StarLet 4 ML robotic workstation: This freely programmable high-throughput post-PCR instrument allows the simultaneous processing of up to 25 plates within couple of hours. It can be adjusted to the proper management of almost any kind of post-PCR sample set-up processes. Sample tracebility is proven by the use of 1D and 2D barcodes. Applied Biosystems AutoMate Express robotic workstation: This stand alone medium-throughput pre-PCR instrument allows the simultaneous processing of up to 13 swabs or other simple samples from autolysis to DNA extract within 1-2 hours. It can be adjusted to the proper management of sometimes problematic sample types (e.g., hairs, bones, etc.). Sample tracebility is proven by the use of 1D barcodes. Applied Biosystems 3500 xL Genetic Analyser: This high-throughput post-PCR instrument allows the simultaneous processing of up to 24 samples within 1 hour. Due to its 6-dye compatibility there is no problem with the most informative STR-PCR kits (e.g., GlobalFiler PCR Amplification Kit - Applied Biosystems, PowerPlex Fusion Systems - Promega, etc.) currently available on the market. Sample tracebility is proven by the use of 1D barcodes. The main function of the Laboratory of Reference Samples Analysis is to determine the DNA profiles of the convicted persons under criminal procedure and the suspects. After conducting the profiling and confirming the DNA profiles in the LIMS system, the results and documents are to be transmitted electronically to the Laboratory of DNA Database Management within the Department of Genetics. These profiles assist law enforcement agencies in identifying perpetrators, linking multiple crime scenes, and resolving missing person’s cases. The department performs nearly 32-40 thousand DNA Profiling annually. Furthermore, the department carries out paternity testing and makes DNA reports for the courts to assist the justice system. DNA testing provides stronger results whether they are inclusions, exclusions, or inconclusive lending to a greater confidence in the justice system. Additionally, DNA testing has played a significant role in the future of this science due to it’s reliability, this is true justice and this is the type of justice. The Section for Polygraph Examination, together with investigative authorities carries out polygraph testing regarding crime cases and administrative proceedings based on court- or prosecution-assignment. Polygraph testing helps the assigning authorities in reconnaissance of crime cases by identifying the perpetrator, clarifying the connection of the witness, suspect or victim with the crime case itself, furthermore, by inspecting the reality content of their statements. A Nemzeti Szakértői és Kutató Központ Békéscsabai Intézetében 11 munkatárs dolgozik. Az intézet az alábbi szakterületeken teljesít kirendeléseket: orvosszakértés, pszichológiai szakértés, ujjnyomatszakértés, fegyverszakértés, írásszakértés, okmányszakértés és nyomszakértés. Az NSZKK Debreceni Intézetének illetékességi területe Kelet-Magyarország, Hajdú-Bihar illetve Szabolcs-Szatmár-Bereg Megye. Természetesen e régión kívülről is kapunk hatósági kirendeléseket, megkereséseket. Magyarország első vidéki szakértői intézeteként 1972-ben alakult meg a Miskolci Igazságügyi Orvosszakértői Iroda, ami 1981-től Miskolci Igazságügyi Orvosszakértői Intézetként működött tovább. Az intézet alaptevékenysége a klasszikus igazságügyi orvostan és az igazságügyi elmeorvosszakértés művelése volt. Az NSZKK Szegedi Intézet elsődleges feladata, mint alaptevékenység a nyomozó hatóságok, bíróságok, ügyészségek, illetve a jogszabályban meghatározott szervek kirendelésére, továbbá megbízás alapján igazságügyi szakértői vélemények készítése az alkalmazott szakértői kompetencia körében, a mindenkor hatályos és az igazságügyi szakértőkre vonatkozó törvények, rendeletek, utasítások, módszertani levelek alapján. A Nemzeti Szakértői és Kutató Központ Szombathelyi Intézetének jogelődje 2008. január 1-én kezdte meg tevékenységét, mint az Igazságügyi Szakértői és Kutató Intézetek Szombathelyi Intézete.